In Unification Grammars (UGs) the content is important. 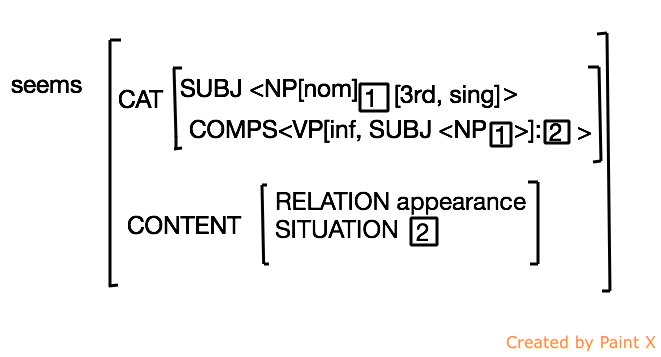 Content is passed up phrase structure trees by exactly the same feature sharing mechanism that we have seen so far. 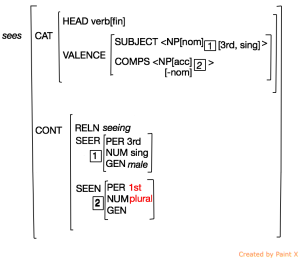 CONTENT is carried up phrase structure trees by exactly the same feature sharing mechanism that we have seen so far. Take a phrase like sees us. If we only have a verb and its complement, we are not able to feature share for the SEER. Now we can complete the content for the sentence. Can you see what the full VP CONT looks like? Just to remind you, here it is again. 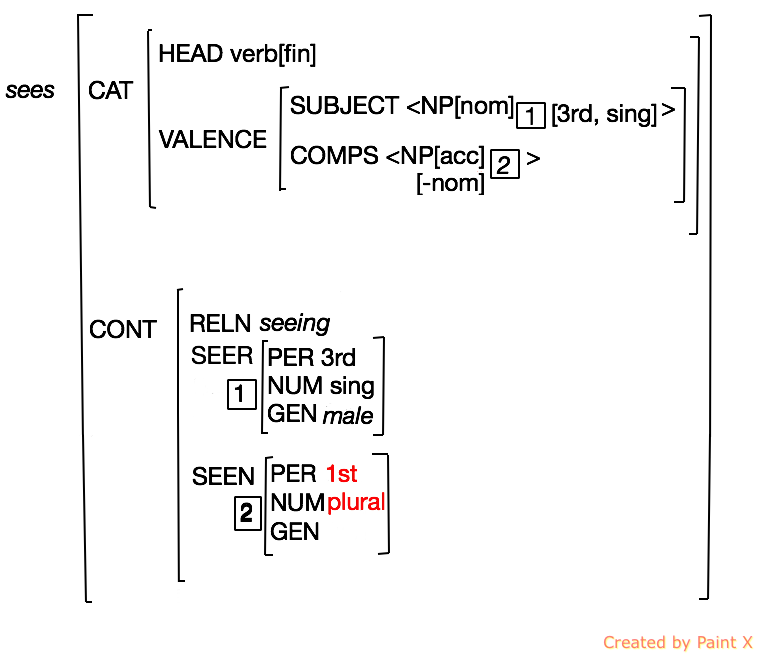 All the compatible information merges, and the CONT is also merged onto the higher levels of the phrase structure tree. This structure-sharing is kind of dynamic. It looks a bit like movement! Consider the word seem. Taro seems to like Hanako. 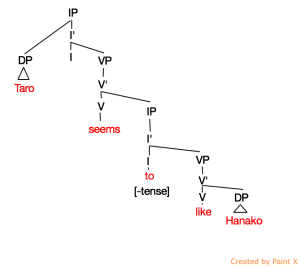 Taro is the logical subject of the [-tense] clause [to like Hanako. How does that happen? Is Taro moved from that position during some kind of transformation? 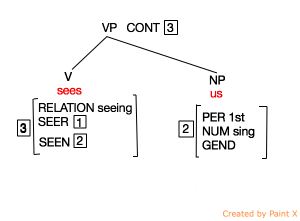 Rather than moving things around, we can just explain the facts by playing with the VALENCE features and CONTENT features of seem. 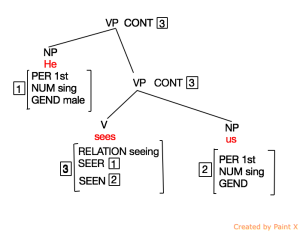 The subject is shared between the main subject of seem and the subject of the VP[inf] complement. Seems takes a nominative subject but that subject plays no active part in the CONTENT of seems. In other words, Taro doesn’t actively do anything the way a SEER sees or a WALKER walks. 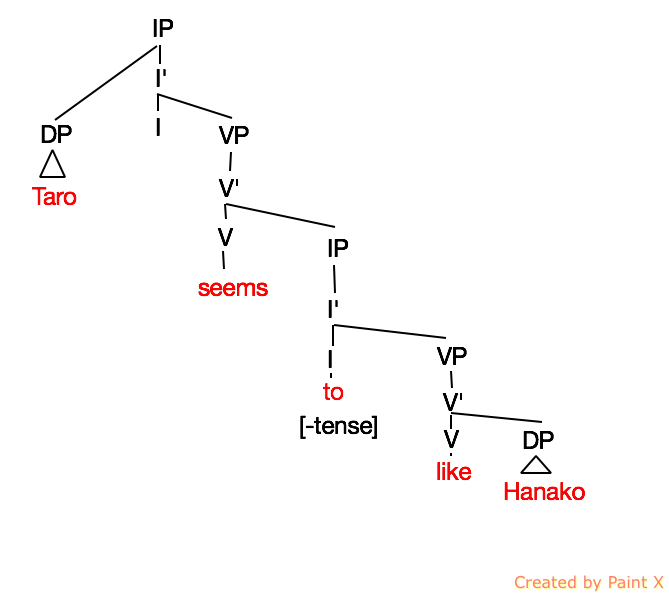 to like Hanako: Notice that the SUBJECT is empty but that the CONTENT is passed up the phrase structure tree through the head V and VP as we expect. seems to like Hanako. 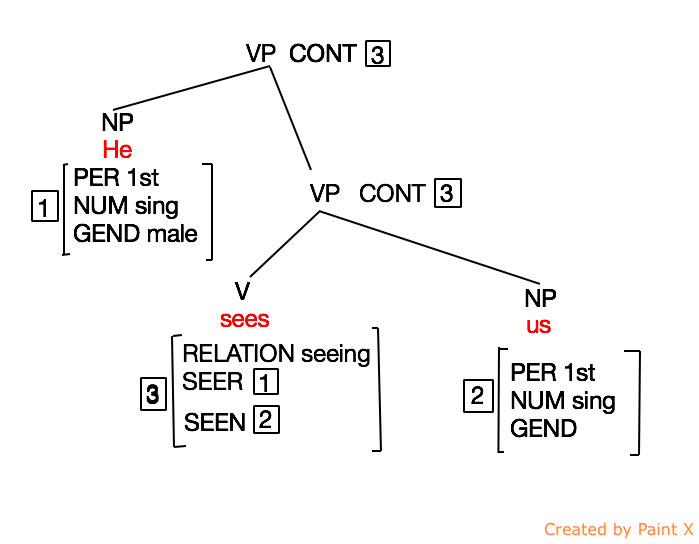 Seems takes a VP[inf] as its complement. This complement VP has a SUBJECT matched with the SUBJECT of seems. Notice the numbers in blue. 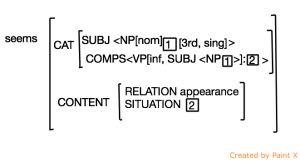 Seems also targets the CONTENT of this VP[inf] and uses it to say “this is the situation as it appears to be.” How cool is that?! Finally, we add the subject Taro and this merges with the subject of the VP [inf] and the LIKER in the CONTENT at every level. Finally, the main subject Taro is added. 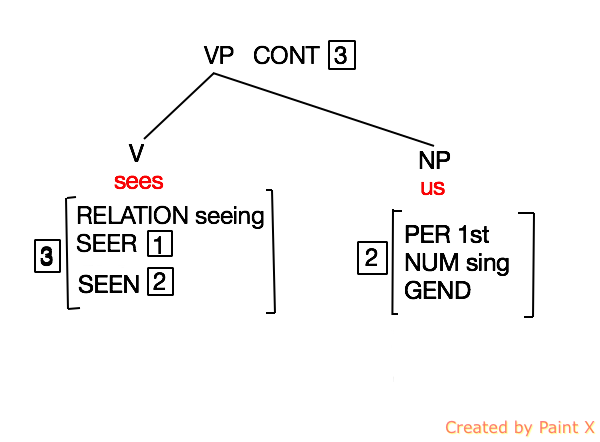 This unifies with the SUBJECT of VP[inf] and LIKER in the CONTENT of the verb like and the VP [inf]. This information eventually merges in the CONTENT of seems and appears as the CONTENT of the whole sentence.